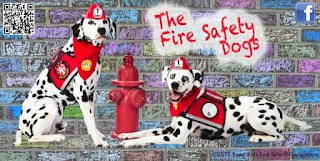 Fire Safety Rocks: Fire Safety Dogs on Animal Radio with FIDO Friendly Magazine! Fire Safety Dogs on Animal Radio with FIDO Friendly Magazine! Thanks to Susan Sims from FIDO Friendly Magazine for the wonderful interview on Animal Radio last week! The Fire Safety Dogs and I have fun during the interview and it was broadcast on our end from Sparkles' Clubhouse! To listen to the interview and to learn more about the Fire Safety Dogs, Sparkles' Clubhouse and the Keep Kids Fire Safe Foundation's programs, click HERE. Thank you FIDO Friendly Magazine and Animal Radio!